What’s the Difference Between Beer and Cider? Beer is one of the most popular alcoholic beverages around the world, but cider, a staple in Britain, is growing in popularity in the states. 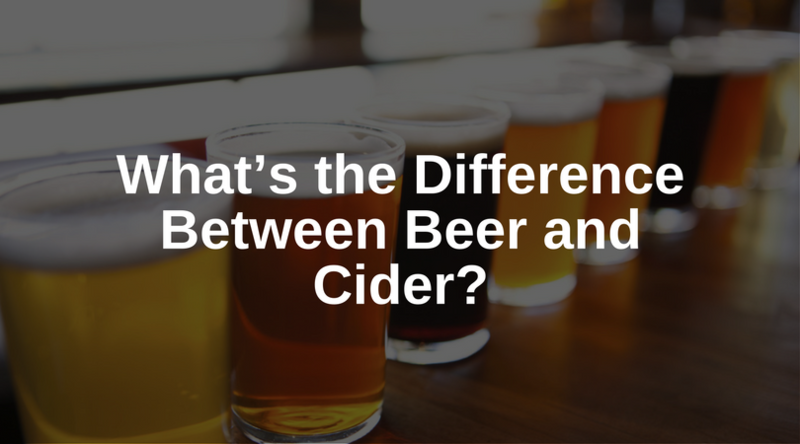 Most cider and beer lovers have a hard time differentiating between the two. Here are a couple of differences you should be knowledgeable of. Beer is made from malted barley while cider is made from fermented apple juice. There are several beers that contain fruit and other ingredients, but the core is always malted barley. No true cider contains malted grains. Beer comes in a variety of colors from pale to very dark depending on the malt. Ciders are often yellow, orange or brown. Ciders may also vary in cloudiness and sediment due to the fermentation process and filtering. The amount of sugar in beer compared to cider is the biggest difference. Beer contains a larger amount of complex sugars post fermentation which aids in balancing bitterness and rounds out the mouthfeel. Beer and Cider both can have sugar added to it in order to dry it out or even to increase the sweetness. Sugar is not used post fermentation to sweeten beer while with cider it can be used pre or post filtering to balance the acidity or mouthfeel. Cider contains a higher quantity of sugar and varies per brand. Dry ciders allow the yeast to feed on the natural sugars to create a less sweet and higher alcohol content. As well as the difference in fermentation, beer is boiled while cider is more often than not, not boiled. The fruit juice in ciders contain antioxidants including polyphenols. According to one study, these antioxidants have been linked to protecting against certain types of cancers, cardiovascular diseases, and neurodegenerative diseases. Naturally occurring polyphenols are present in hops and malts, but brewers often remove it during the beer-making process because it makes the beer cloudy. In a study conducted by the Harvard School of Public Health, beer does contain flavonoids (a type of polyphenol compound) that may be good for your heart. Beer and cider have a similar alcohol content, but in America cider can be alcoholic as well as non-alcoholic. In most English speaking countries, cider is synonymous with alcoholic apple fermented products and apple juice encapsulates all of the other varieties of non-alcoholic apple beverages. Beer always contains alcohol. These differences don’t make one better than the other. Some may say people who aren’t beer drinkers should start off with ciders and work their way to beer. Regardless of preference, there are a variety of ciders and beers to choose from. If you would like to taste the difference between a cider and beer, try McKenzie’s Hard Cider and Stella Artois Cidre.